This module produces XML and HTML representations of PREMIS metadata for objects in your repository. Currently, it documents all fixity checks performed on datastreams, includes 'agent' entries for your insitution and for the Fedora Commons software and, maps contents of each object's "rights" elements in DC datastreams to equivalent PREMIS "rightsExtension" elements. PREMIS XML describing all the datastreams in an object looks like this, and a HTML rendering looks like this. Islandora Checksum Checker: periodically verifies checksums on datastreams and will populate your Islandora objects' audit logs with fixity checking 'events' that map to PREMIS. 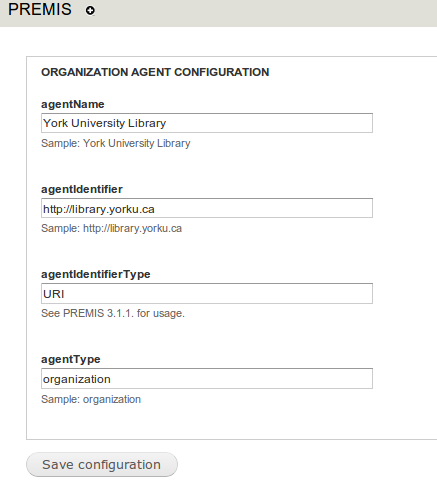 Set your institution's 'agent' settings Administration » Islandora » Islandora Utility Modules » PREMIS (admin/islandora/tools/premis). Set your permissions for 'View PREMIS metadata' and 'Download PREMIS metadata' at Administration » People » Permissions (admin/people/permissions).